Everyone is aware that college is incredibly expensive, with tuition rates getting higher every year. In the past 35 years, college tuition gone up by an incredible 1,200 percent! Currently, the average tuition for a public university is a little over $22,000, and the average tuition for a private university is a staggering $45,000. The most prestigious universities will set you back more than $60,000 each year. Private student loans, which are loans from private lenders, such as credit unions or banks. There are distinct advantages to federal student loans, such as fixed low interest rates, and flexible repayment plans. A federal student loan is typically less expensive than a private student loan. Unfortunately, federal student loans don’t usually cover the full tuition costs, and have strict limits as to how much students can borrow. When a federal student loan isn’t enough, you can pay the rest of your tuition with a private student loan. Private student loans are typically offered by a bank or other private lender. They usually have a variable interest rate between 3 and 12 percent, and are accompanied by several other fees and charges. Currently, the majority of private student loans require a cosigner, particularly for young students without a credit history. Many families consider private student loans to be a last resort. However, with careful research, most students can find a private loan that meets their needs. 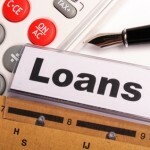 The interest rate of a loan should be one of your first considerations. The interest rates of federal student loans are the same for all borrowers, but the interest rates for private student loans change depending on the borrowers’ credit scores. Students with higher credit scores will qualify for a lower interest rate loan. Potential borrowers with low credit scores, or who are lacking credit history, should obtain a cosigner with good credit. It can be a parent or other family member. This increases the chance of approval, and may also lower the interest rate. However, a cosigner should always be made aware of the risk he or she is taking. Don’t make the mistake of simply choosing the private student loans with the lowest interest rates. It makes more sense to consider the Annual Percentage Rate (APR). The APR takes into account factors like deferments and repayment terms, which will have a large impact on the final cost of your loan. Additionally, it is almost impossible to see the interest rate of a loan until your application is reviewed, but APR is provided up front, which allows you to compare different loans. Examples of APR will show the highest and lowest interest rates possible, so you can deduce that your loan’s interest rate will be somewhere in the middle. When choosing a private student loan, make sure you choose a lender who offers flexible repayment plans. Some banks require students to begin making payments immediately, while others let students defer payments until after graduation. Some student loan providers offer additional perks to borrowers. These benefits may be things like lower interest rates for students who sign up for automatic payments. If you choose an automatic payment plan, many lenders will reduce your interest rate by 0.25 to 0.50 percent. This may not sound like much, but over the entire loan period, it can add up to hundreds of dollars. Always read the terms of bonuses carefully. There can be penalties for students who do not keep their side of the bargain. When choosing the lender for your private student loan, make sure the bank has a good reputation and helpful customer service. When you call your loan company, customer service representatives should thoroughly answer all your questions, and make sure you understand the entire borrowing process. Does your lender provide an online student loan application? Are customer service representatives available 7 days a week, without unreasonable hold times? Can you access your loan information from a secure website? Have you seen many complaints online from students and borrowers? Has this lender been recommended by your college? Many universities can provide you with a list of preferred lenders, and this should include contact information for the lenders they recommend. The most highly recommended lenders will offer the best interest rates and provide better customer service. You can obtain a list from either your college’s website or your financial aid office. Students should start by obtaining a federal student loan, and then make up the difference with aprivate student loan. Give yourself sufficient time to compare lenders, so you know you are getting the best rates. Always read the fine print, and ask your university’s financial aid office to recommend reputable lenders.